"I was all over the place, had no idea where the ball was going," Kershaw said. "I'm getting worse as the spring is going. I walked three in three innings. I have a lot of things to figure out. I would have liked to get through four innings, but my pitch count was so high I couldn't do it." I wouldn't be too concerned about his recent outings this March. Spring training is for working out the kinks and Kershaw appears determined to do just that. Given his history and his desire to be the best pitcher in the league, I find his words encouraging. 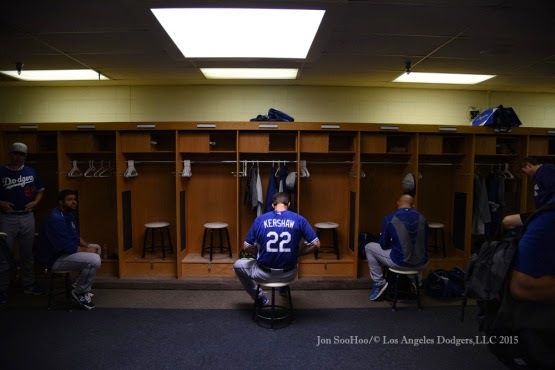 The photo above was taken by Jon SooHoo/LA Dodgers 2015. Go here to check out more photos from Jon from yesterday. I don't think their unfamiliarity with each other is an issue. Certainly, there's an learning curve they both have to go through, but I doubt it played a part in yesterday's game. Via Kevin Baxter at the LA Times, "Dodgers' Clayton Kershaw, Yasmani Grandal may not be on same page yet." "I think they bring a ton to the table for us," Mattingly said. "They create stability up the middle. Both those guys come from good organizations with winning traditions, and still can play and are leaders. Also, two guys who are still playing really well." ICYMI, Julio Urias, Chris Anderson, Ryan Buchter and Josh Ravin were sent to the Dodgers' minor league camp. Eric Stephen at True Blue LA has more. Via Ken Gurnick at MLB.com, "Dodgers' Tsao could pull off rare feat by returning to Majors." "His stuff is good," said Mattingly. "I kind of left him in there for a shot at Cano and those guys. He's been interesting to watch." Via Jon Weisman at Dodger Insider, "New AM 570 LA Sports debuts today."